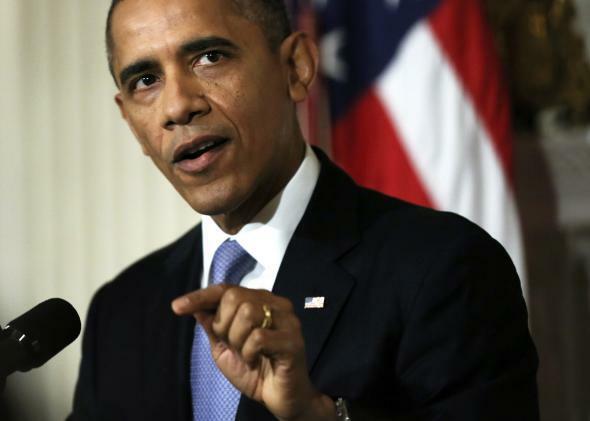 2013 shutdown politics: How Obama will make the debt fight a weapon against Republicans. How Obama will make the 2013 shutdown a political weapon. President Obama at the White House on Oct. 17, 2013, drawing lessons from the shutdown. “There are no winners here,” President Obama declared at the White House this morning. Then, with an elegant air of nonpartisanship, Obama began to fashion the shutdown into a political weapon. Here’s how he’s going to deploy it. 2. Republican downgrade. Two years ago, when Standard and Poor’s downgraded the government’s credit rating, it cited our high deficits as well as the 2011 debt ceiling standoff. Ever since, Republicans have argued that the deficits, not the standoff, caused the downgrade. This time, we haven’t been downgraded, but we’ve been put on a credit watch by Fitch, another ratings agency. And this time, there’s no ballooning deficit. Obama wants to make that difference stick. He wants the downgrade threat of 2013 to reinforce the Democrats’ narrative about the downgrade of 2011. “The agency that put America’s credit rating on watch the other day explicitly cited” the congressional standoff, Obama pointed out. The Fitch report, he went on, said that “our economy remains more dynamic and resilient than other advanced economies and that the only thing putting us at risk is—and I’m quoting here—‘repeated brinkmanship.’ ” “That wasn’t a political statement,” Obama added, politicizing the statement. been hearing from their counterparts internationally. Some of the same folks who pushed for the shutdown and threatened default claim their actions were needed to get America back on the right track, to make sure we’re strong. But probably nothing has done more damage to America’s credibility in the world, our standing with other countries, than the spectacle we’ve seen these past several weeks. It’s encouraged our enemies. It’s emboldened our competitors. And it’s depressed our friends who look to us for steady leadership. If Republicans stage another big fight over the next debt ceiling, that would be three in a row. It might facilitate a significant political development: the transformation of debt payment into a national security issue. Republicans could become the deadbeat party. Obama seems quite willing to attack them from this angle. And in framing economics as the key to American power, he has reality on his side. One of the things that I hope all of us have learned these past few weeks is that it turns out smart, effective government is important. It matters. I think the American people, during this shutdown, had a chance to get some idea of all the things, large and small, that government does that make a difference in people’s lives. You know, we hear all the time about how government is the problem. Well, it turns out we rely on it in a whole lot of ways. Not only does it keep us strong through our military and our law enforcement—it plays a vital role in caring for our seniors and our veterans, educating our kids, making sure our workers are trained for the jobs that are being created, arming our businesses with the best science and technology so they can compete with companies from other countries. It plays a key role in keeping our food and our toys and our workplaces safe. It helps folks rebuild after a storm. It conserves our natural resources. It finances startups. It helps to sell our products overseas. It provides security to our diplomats abroad. So let’s work together to make government work better, instead of treating it like an enemy. Congratulations, Tea Party. In the midst of Obamacare’s glitch-ridden debut, you did the one thing that could make us love our government: You took it away and held it hostage. Don’t expect any thanks from the president you helped.